Many how-to books try to instruct readers in what to do. The Little Blue Book for Filmmakers goes one step further: It tells how to be. The authors make it clear that success as a filmmaker—in movies, television, videos, commercials, and more—depends as much on how you behave as well as what you know. Clear admonitions such as “Don’t be fawning or obsequious” and “You can’t know everything” are added to a chapter that establishes the director-filmmaker as the almost absolute boss on the set. Their message is clear: Lead as a military general, but not as a petty dictator. The book’s first chapter draws a clear picture of the director’s position in a hierarchy that includes everyone from producers to the entire army of assistants that are needed to bring a project to life. Each of the areas of production, from the most creative to the most menial, is discussed and described. The book points out that the credits for a large budget film can contain as many as a thousand names. Each category of “above the line” (creative) and “below the line” (production) worker gets a concise description. In addition to having a solid knowledge of their craft, the authors make it obvious they love that craft and have both an understanding and affection for all the various colleagues who make it happen. The directions to actors are helpful to those experienced in the field as well as to the novice. Instructions such as “Don’t look down to find your mark” and “Find your light” will help a first-time film actor avoid looking like a beginner. The pages discussing actors’ bad habits will help remind even the most seasoned pro how to improve performances. In addition to defining movie and television terminology in every chapter, the book provides a glossary of important expressions. There is also an interesting compilation called The Authors’ Arbitrary List for Film Literacy. The 403 films on the list cover the entire range of movie technique and history. 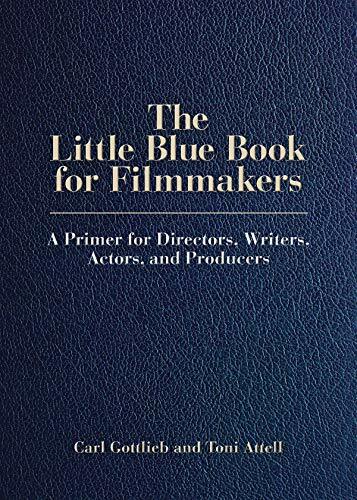 The Little Blue Book for Filmmakers is a useful resource not only for those in the profession, but also for anyone who enjoys knowing what goes on behind the scenes of their favorite movies and television shows.